↑ Robert Reid, Marie Curie (ម៉ារី គុយរី), p. 184. ↑ ប៉ូឡូញ​ត្រូវបានចែកជាចំរៀកនៅសតវត្សរ៍ទី១៨ រវាង​រុស្ស៊ី ព្រុស្ស៊ី និង អូទ្រីស។ ក្ដីសង្ឃឹម​របស់ស្កូដូស្កា គុយរី​ក្នុងការដាក់ឈ្នោះ​អោយធាតុគីមី​តាមឈ្មោះ​មាតុប្រទេស​របស់ខ្លួននោះ គឺចង់ទាញចំណាប់អារម្មណ៍របស់​ពិភពលោក​មកកាន់​ប្រទេស​ដែលស្រេកឃ្លាន​ឯករាជ្យភាព​មួយនេះ។ ប៉ូឡូញ៉ូម​ជាធាតុគីមី​ដំបូងគេ​ដែលត្រូវបាន​ដាក់ឈ្មោះដើម្បីហេតុផល​នយោបាយ។ K. Kabzińska, "Chemical and Polish Aspects of Polonium and Radium Discovery" (មើលរបកគំឃើញប៉ូឡូញ៉ូមនិងរ៉ាដ្យូមតាមរបស់គីមីវិទ្យានិងតាមទស្សនៈជនជាតិប៉ូឡូញ), Przemysł chemiczny (ឧស្សាហកម្មគីមី), vol. 77, 1998, pp. 104–7. ↑ Henryk Zieliński, Historia Polski 1914–1939 (ប្រវត្តិសាស្ត្រប៉ូឡូញ៖ ១៩១៤–៣៩), Ossolineum, 1983, p. 83. ↑ Robert Reid, Marie Curie(ម៉ារី គុយរី), p. 12. ↑ ៦,០ ៦,១ Eve Curie, Marie Curie(ម៉ារី គុយរី). ↑ Reid, Robert William (1974)។ Marie Curie។ London: Collins។ ទំ. 19។ ល.ស.ប.អ. 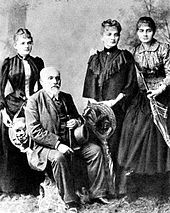 0-00-211539-5។ "Unusually at such an early age, she became what T.H. Huxley had just invented a word for: agnostic." ↑ Robert Reid, Marie Curie (ម៉ារី គុយរី), pp. 23–24. ↑ Robert Reid, Marie Curie (ម៉ារី គុយរី), p. 24. ↑ Robert Reid, Marie Curie (ម៉ារី គុយរី), p. 32. ↑ ១១,០ ១១,១ ១១,២ ១១,៣ ១១,៤ ១១,៥ ១១,៦ Wierzewski, p. 17. ↑ Robert Reid, ម៉ារី គុយរី, pp. 61–63. ↑ Robert Reid, ម៉ារី គុយរី, pp. 63–64. ↑ Robert Reid, Marie Curie, p. 64. 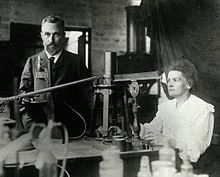 ↑ Robert Reid, Marie Curie, pp. 64–65. ↑ Robert Reid, ម៉ារីយ៉ា គុយរី, p. 65. In fact, such multiple, independent discoveries appear to be the rule in science and technology; see List of independent discoveries. ↑ ១៨,០ ១៨,១ Robert Reid, Marie Curie, p. 65. ↑ L. Pearce Williams, pp. 331–32. ↑ ២១,០ ២១,១ L. Pearce Williams, p. 332. ↑ Robert Reid, ម៉ារីយ៉ា គុយរី, p. 265. ↑ Barbara Goldsmith, Obsessive Genius, p. 149. ↑ Barbara Goldsmith, Obsessive Genius, pp. 170–71. ↑ Robert Reid, Marie Curie (ម៉ារី គុយរី), pp. 44, 90. ↑ Barbara Goldsmith, Obsessive Genius, pp. 165–76. ↑ Blom, Philipp (2008)។ "1903: A Strange Luminescence"។ The Vertigo Years: Europe, 1900–1914។ Basic Books។ ទំ. 76។ http://books.google.com/books?id=-3G9gMNCpowC&pg=PA76&dq=%22The+glowing+tubes+looked+like+faint,+fairy+lights.%22&hl=en&ei=-UQATfz7HMTflgekvdzACA&sa=X&oi=book_result&ct=result&resnum=1&ved=0CC4Q6AEwAA#v=onepage&q=%22The%20glowing%20tubes%20looked%20like%20faint%2C%20fairy%20lights.%22&f=false។ បានយកមក 8 December 2010។ "The glowing tubes looked like faint, fairy lights." ↑ Bryson, A Short History of Nearly Everything (ប្រវត្តិសាស្ត្រខ្លីមួយស្ដីពីអ្វីៗស្ទើទាំងអស់), p. 148. ↑ "Marie Curie voted greatest female scientist"។ London: www.telegraph.co.uk។ 2 July 2009។ http://www.telegraph.co.uk/scienceandtechnology/science/sciencenews/5715220/Marie-Curie-voted-greatest-female-scientist.html។ បានយកមក 10 April 2010។ "Marie Curie, the Nobel Prize-winning nuclear physicist has been voted the greatest woman scientist of all time." 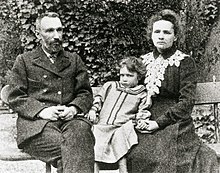 L. Pearce Williams, "Curie, Pierre and Marie (គុយរី, ព្យែរនិងម៉ារី)", សព្វវចនាធិប្បាយអាមេរីកាណា, ដាន់ប៊ឺរី, ខន់ណិកធីខាត់, Grolier, Inc., ១៩៨៦, vol. 8, pp. 331–32. Barbara Goldsmith, Obsessive Genius: The Inner World of Marie Curie (អ្នកមានទេពកោសល្យដ៏លើសលប់ ៖ ពិភពលោកខាងក្នុងរបស់ម៉ារី គុយរី), ញូវយ៉ក, W.W. Norton, ២០០៥, ISBN 0-393-05137-4. Naomi Pasachoff, Marie Curie and the Science of Radioactivity (ម៉ារី គុយរី និងវិទ្យាសាស្ត្រវិទ្យុសកម្ម), ញូវយ៉ក, Oxford University Press, ១៩៩៦, ISBN 0195092147. Eve Curie, Madame Curie: A Biography (ម៉ារី គុយរី ៖ ប្រវត្តិរូបមួយ), បកប្រែដោយ Vincent Sheean, Da Capo Press, ២០០១, ISBN 0306810387. Susan Quinn, Marie Curie: A Life (ម៉ារី គុយរី ៖ ជីវិតមួយ), ញូវយ៉ក, Simon and Schuster, ១៩៩៥, ISBN 0-671-67542-7. Françoise Giroud, Marie Curie: A Life (ម៉ារី គុយរី ៖ ជីវិតមួយ), បកប្រែដោយ Lydia Davis, Holmes & Meier, ១៩៨៦, ASIN B000TOOU7Q. Redniss, Lauren, Radioactive, Marie & Pierre Curie: A Tale of Love and Fallout (វិទ្យុសកម្ម, ម៉ារីនិងព្យែរ គុយរី ៖ រឿងនិទានអំពីស្នេហានិងភ្លៀងវិទ្យុសកម្ម), ញូយ៉ក, Harper Collins, ២០១០, ISBN 9780061351327.